This may be one of the more common cocktail party questions that veterinary ophthalmologists get asked! Not that eyes in any species are not cool, but a little exotic flavor can spice up the conversation. 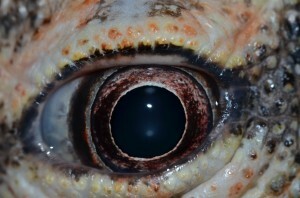 Fortunately for us veterinary ophthalmologists, the anatomy of the eye is very similar from species to species. 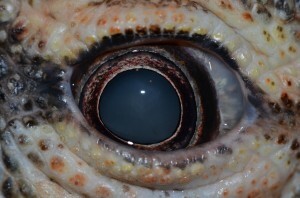 There are significant changes when going from mammal to bird to fish since the anatomy is altered to maximize performance depending on the environment in which an animal lives, however, the main structures are present in most eyes. Disease states will also be different based on these living conditions and expectations of performance since these conditions are varied. Thus, understanding the species variations is important to help one in coming up with a list of differential diagnoses for a given lesion in a given species. Alas, this part is interesting to the ophthalomogist but the attentive crowd at the cocktail party may start to thin! And so, we stick with the coolest creature answer and go from there! Fortunately, the instrumentation used to examine the dog, cat and horse will also work for the mouse, elephant and eagle. As shown in a prior posting, the slit lamp biomicroscope and the binocular indirect ophthalmoscope are mobile instruments that, if one can get close enough, will allow a good view of the eye in dry conditions. Yes, sedation is occasionally needed for uncooperative animals, but most creatures can be evaluated without much in the way of heavy restraint. Dare I say, even with angry dogs and cats, trauma to the doctor or technician is usually limited to the occasional scratch with proper positioning and respect. At this juncture, my caseload is mostly limited to the animals that can walk, fly, swim or get carried into the clinic. 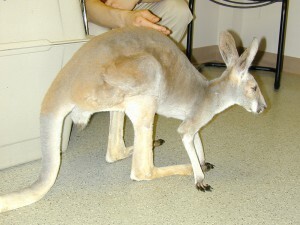 Large animals, including the exotics, require a field visit which are done on a selective basis. Some of my colleagues specialize in horses or farm animals and some of us may have a relationship with a local zoo, for example, to assist in those needs. We have helped with the Norwalk Aquarium on occasion as well as with numerous wildlife rescue agencies in the area. I will admit, it spices up the day for us, too, to get a break from the dogs and cats that make up 95% of what I see. 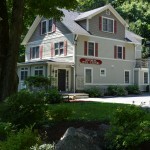 Therefore, most of our exotics come from these realms as well as second opinions from local boarded exotic specialists. Enough chatter! Here are some pictures of some patients that have graced our practice. Some we can help and others have sustained too much damage to repair. But most are attached to someone who cares and is willing to treat them with the hope of making their life better! 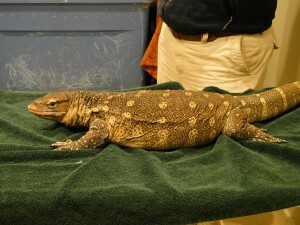 Grumpy above is a Nile Monitor that presented for evaluation of a hazy eye. All animals with a crystalline lens can get cataracts and Grumpy was no exception. Fortunately for him, it only affected one eye so a performance decline was not evident. 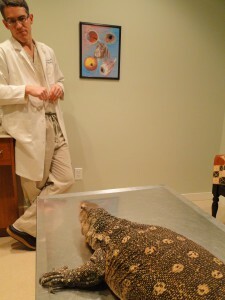 As long as he can see his food and amble about his environment, cataract surgery, although a possibility in reptiles, is not needed. He was quite friendly, however, it is always nice to have a handler around to help with restraint! What is a sugar glider you ask? These cute little creatures are omnivorous gliding possums typically found in Australia. They are marsupials and get their name from there enjoyment of nectar and glide like a flying squirrel. 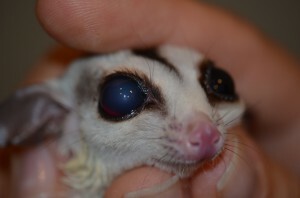 As with many nocturnal animals, sugar gliders have large eyes to help them see in the dark. The one I saw was a pet that developed inflammation and glaucoma which is increased pressure inside the eye. This guy was very sweet, easy to examine due to his large eyes and liked to hide in a pouch the owner strapped around her neck. 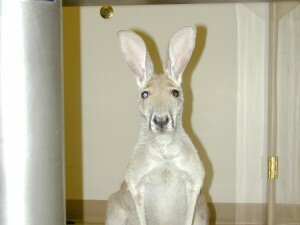 Speaking of marsupials, kangaroos and their cousins are very interesting critters that ophthalmologists will see for cataracts at a very young age. Hand raised orphans fed cow’s milk become affected because of a metabolic inability to convert the galactose in the cow’s milk to lactose. This allows a product called dulcinol to accumulate in the lens which pulls fluid into it, makes the fibers swell and a complete cataract forms. The cataracts can be prevented by the use of a milk substitute used in human infants with inherited galactosemia instead of a standard cow’s milk. Cataract surgery can be performed in these species with limited success because the vitreous, the gelatinous substance between the lens and the retina, becomes opaque as well with an unknown substance. So if surgery is performed, you not only have to remove the opaque lens but the opaque vitreous as well which is rather sticky and handles like old cotton candy. Unfortunately, even if successful with those manipulations, they also have a high tendence to develop glaucoma after surgery presumably from drain obstruction. Prevention is the key here. The Norwalk Aquarium will call me every once in a while to look at animals there that have ocular changes. Most display fish are exactly that, one of many in a tank used for education. However, survival of the fittest may still hold truth both for large tanks or small. When one cod got bilateral cataracts, the question was whether this would affect the fish to be able to adequately eat and protect itself in the tank. 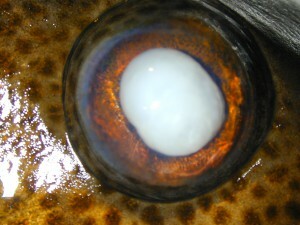 Lens extraction was performed in this cod (the lens was shifted or luxated out of position as well) to assess whether this surgery would positivley effect the fish itself. In addition, we were also assessing the anesthetic regimen and, if successful, would it be a consideration for other more “prized” fish in the future. The seals at the Norwalk Aquarium have had occasional issues associated with trauma or common risks in captive pinnipeds. 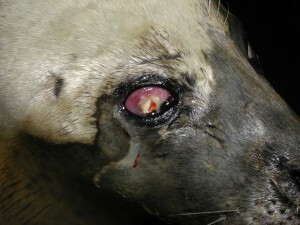 Cataracts and luxated lenses are occasionally noted in captive seals and we assisted with the followup care after lens surgery was performed in the past by one of my colleagues and her team who specialize in pinniped disease (who knew, right?!). We have also assisted with management in corneal injury or degeneration in the older members. Be careful looking at these critters who can be fast and unwilling to hold still! This poor girl had a degenerate cornea we watched mother nature mend with some supportive care by their great staff to avoid surgery. Birds of prey are fascinating creatures with excellent vision and beautiful ocular structures to aid them in hunting prey. Many of the wildlife rescue organizations will see, treat and release these birds if they are not critically injured. 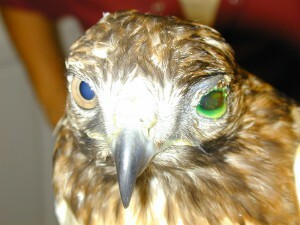 Unfortunately, trauma to the head of these birds is not uncommon, usually associated with motor vehicles, and the eye is often involved. Our role is to assess these birds to see if there is vision and if there is any reversible issue that can be improved with medication or surgery. This all factors in to the ultimate decision as to whether the animal can be released back into the wild or used as a display bird. I have seen hawks and owls primarily. We even did cataract surgery in a great horned owl after we designed an intraocular lens to use to get the visual acuity back! 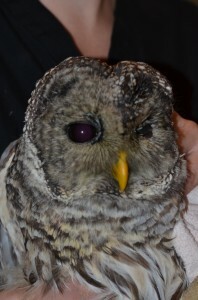 The hawk and owl below were not so lucky with significant damage to the left eye (hawk and owl) and central nervous system (owl) that rendered them blind. Alas, I am starting to ramble and this digital cocktail party is moving along. I could still tell you about the giraffe, fox, gekko, rooster….hey, wait, here comes the passed hors d’oeurves. Ask me about it at the next party! Waiter!!! !